Why Choose a Master Elite Contractor? 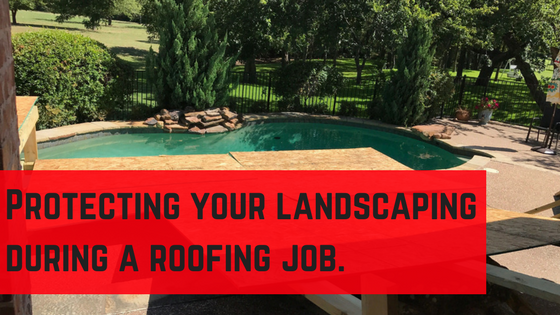 Preparing for a roofing project on your #1 asset should not only include activities from you, the property owner, but also your contractor. At Excel Roofing & Construction we walk the property with you to identify any areas of specific concern. One of the most overlooked and damaged items during roofing is your precious landscaping. When workers are on the roof they do not see below the roofline. Excel Roofing and Construction’s exclusive Asset Protection Package takes this worry out of the equation. Your sales professional will walk the perimeter of the home and formulate a plan to build various shelters where applicable for plants, pool equipment, and HVAC units. In areas where tarps are appropriate, these areas will be highlighted as well. The best way to have a successful project is start with a plan. This plan will include photos and notes to our production team. In many cases, our team will arrive the day before the actual roof to construct the landscape shelters. Taking this extra step makes for a much smoother roofing day. The crews will arrive on roofing day and spread tarps where appropriate and begin work. Excel Roofing and Construction owns the only Equipter RB4000 roofing buggy in the State of Texas. We have invested in protecting your assets with one of the most cutting edge pieces of equipment in the roofing industry. To see the Equipter RB4000 in action: https://www.equipter.com/equipter-videos/shingle-lift/ The use of the Equipter will help to ensure fewer shingles hit the ground and less potential damage to your property. We take protecting your asset to the next level using innovative technology, shelters, and a plan. Don’t settle for less when you can afford the best. If your home is being re-roofed as part of an insurance claim in most cases your insurance company will cover any costs associated with protecting your landscaping, pools, HVAC equipment, and pretty much any other fragile items below the roofline that would be a potential to acquire damage during a roofing project. When dealing with an insurance claim your obligation is your deductible and their obligation is all of the other proceeds to ensure the home is restored to pre-loss condition. In its pre-loss state the landscaping was not broken from roofing or full of roofing debris, therefore they will pay to protect your assets in the case that you have decided to work with a capable contractor. If you are looking for a Fort Worth roofing contractor call us at 817-645-1788.